The US/CIA/NATO have stepped up their military operations and continue to actively wage their secret war in Ukraine against the Ukrainian people in an extremely dangerous poorly planned operation that is failing and carries with it the real threat of sparking off a full-fledged war, if not World War III, against an unwilling Russian Federation which continues to attempt to deal with the aggressive-in-your-face-threat to its security through diplomacy and peaceful means. The recent capture and killing of 25 CIA officers in Ukraine only shows the desperation of the US effort and the complete disregard for not only international law and the people of Ukraine but also for the lives of their own CIA personnel. “At least 650 servicemen were killed, wounded or taken prisoner in the past ten 10 days,” he said. “There are 70 foreigners among them and of those 13 agents of the US Federal Bureau of Investigation (FBI) and Central Intelligence Agency (CIA) were killed and 12 others were wounded”, Ponomaryov told reporters. The Mayor also said that the self-defense forces afflicted heavy losses on Right Sector/Ukrainian army forces and also completely wiped out the junta’s “Alpha” operatives. Due to the fact that the denial comes through a Twitter post and not from an official CIA or FBI statement, or from the White House for that matter, and that the CIA/FBI is heavily involved in illegal operations in Ukraine and has been for decades, I would argue that it is a given that the CIA has lost officers, agents, mercenaries and support staff in Ukraine. That is almost a given, the only question is how many. Due to the huge flow of information and the massive amount of reports, leaks and revelations there is little debate in the media about one simple fact and that fact is what is most troubling about the entire US/CIA/NATO/EU meddling in the sovereign affairs of Ukraine. To make matters worse the US/CIA/NATO/EU undeniably now have blood on their hands, not only that of Ukrainian civilians, Tatars and Russians but also of citizens of other countries. The fact that is being ignored is that US/CIA/NATO/EU “operations” and meddling in Ukraine are ILLEGAL. From the overthrowing of the democratically elected government, to the shooting and murder of police, to the killing of anyone who is against the junta, to the backing and training of the Right Sector, and finally to the importing of US/CIA/Greystone and other mercenaries to kill Ukrainians, the entire “mission” is illegal. The United States of America is involved in a dirty illegal war in a country it had no business in being in in the first place. The Ukrainian operation serves no us security interest, it is no “protecting American lives” and it does nothing for the American people, to advance democracy or human rights or anything else. US/NATO want missiles in Ukraine to further threaten Russia which has done nothing but to try to be friends and simply do business. 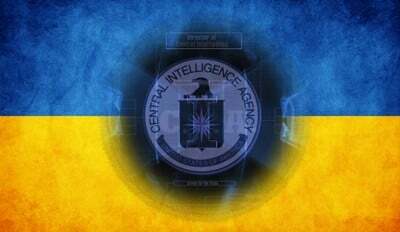 CIA operations in Ukraine are illegal. Period. End of discussion.